A few weeks ago I posted a picture of my daughter's dance recital. 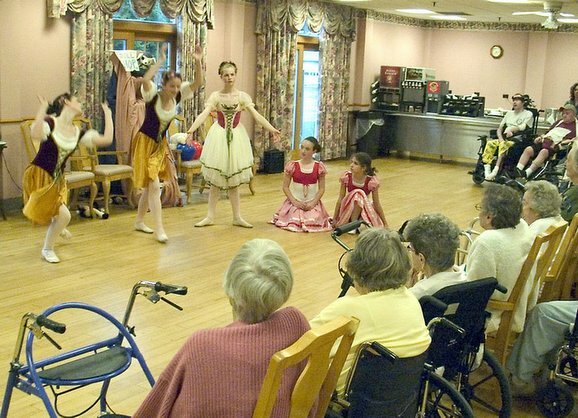 The group was invited to perform at a local nursing home and rehabilitation center. The pictures aren't wonderful because there wasn't much light and my camera doesn't have a powerful flash - but this gives you an idea - the girls danced their hearts out and the residents really enjoyed it. Jenny, the photo is very nice and somehow the color tone is appropriately warm. I think this picture is good! Those folks look like they're really into it. Great stuff. The kids get a chance to practice in front of an audience and the audience enjoy it. I also think this is a great photograph. What a great way to play to an audience and give pleasure to an older generation. With all that has been going on I am only getting a chance to read all the lovely comments that have been made and the one Jenny made just made this aging Granddad’s day.